← Fact Check: Where Is Princeton’s Affordable Housing Concentrated? Princeton and New Brunswick are two anchors of the Central Jersey tech corridor. Both towns are substantial employment centers, and are connected by a chain of residential communities and shopping areas. It should be possible to run an efficient transit service between them, which would allow employees to commute to many workplaces without using a car. But the only transit service is the Coach USA 100 service, a long-distance commuter bus that is operated by Suburban Transit. It suffers from several significant problems that limits its usefulness as a local commuter option, but still works in a pinch. 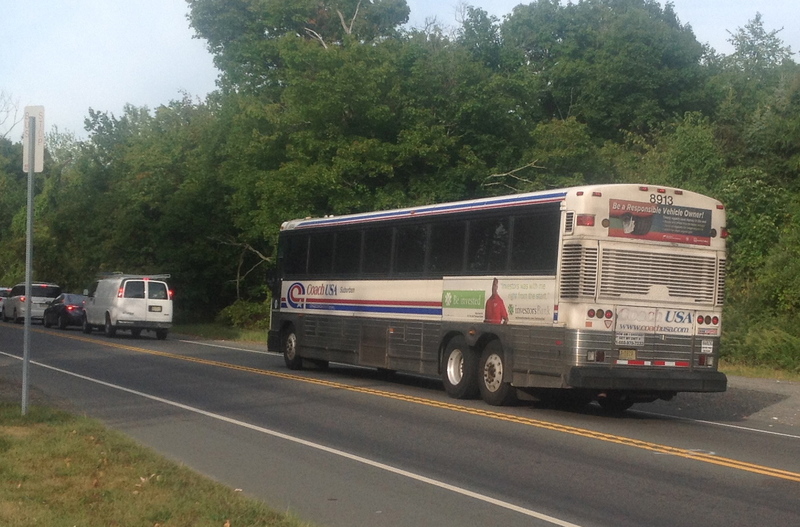 The Coach USA 100 service runs along Route 27 from Princeton (Palmer Square) to New Brunswick, before heading out onto the Turnpike and on to New York City. It is intended primarily as a commuter bus for people heading to the City, but it is also possible to buy a local ticket, for journeys to and from Princeton and New Brunswick. This offers several advantages relative to the NJ Transit rail service. First, the bus goes from central Princeton, which means it is easier to access for many Princeton residents than the local rail stations. Second, the bus picks up at many stops along Route 27, providing easy parking options/access for residents along the way. A ticket from Princeton to New Brunswick costs $3.60 each way, and the 16-mile journey notionally takes 45 mins. This year, I had to visit New Brunswick for work fairly regularly. 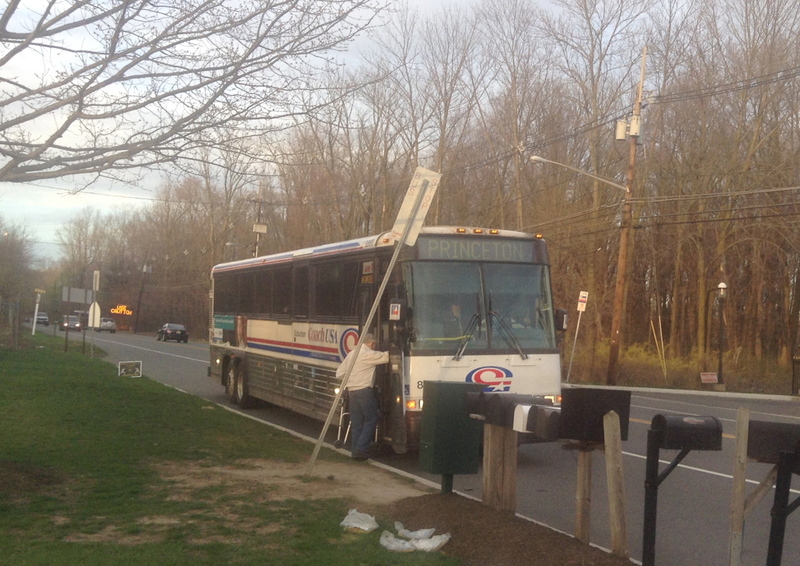 Sick of the traffic, and hoping to lower my carbon footprint, I decided to give the Coach USA bus a try. The price seemed reasonable, and the bus showed up at my bus stop (just outside of Kingston) pretty reliably on time in the morning. The coach itself is comfortable, and although it can get busy, you always get a seat. But the journey time doesn’t compete with driving. Even with traffic, it’s usually possible to get to New Brunswick in 40 mins by car. The 100 bus timetable allows for 45 mins, and never achieves that. Add in some necessary time waiting for the bus, and it becomes significantly longer than driving, especially if you have to walk a bit to get to your destination at the other side. 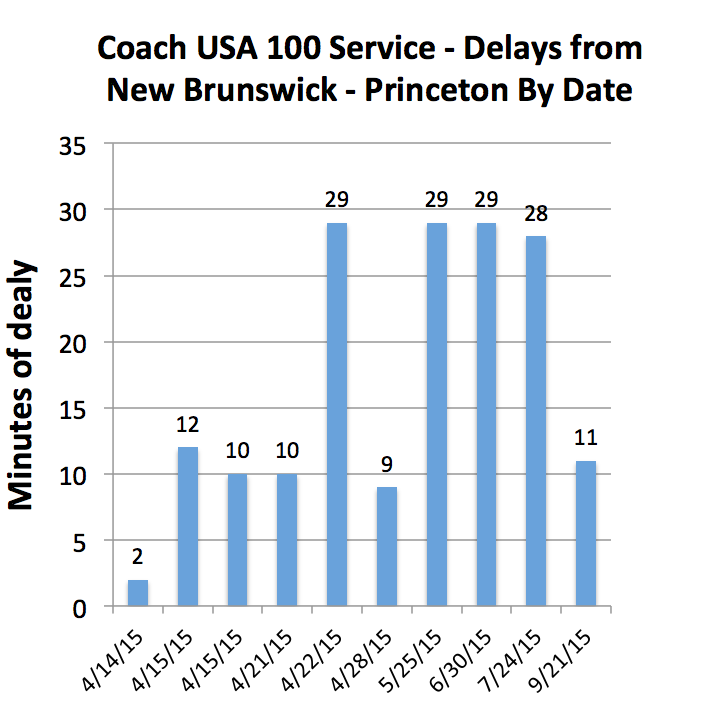 Measured delays on Coach USA service between New Brunswick and Princeton in 2015 (click to expand). Another problem is frequency. Even at rush hour, buses are running at a max of two per hour, which means you have to be organized to ride them. Reliability is also horrible on the return leg from New Brunswick to Princeton. Delays of 20 or 30 minutes are not unusual (see chart above). This isn’t such a big surprise considering the bus is coming all the way from New York, but that fact is irrelevant when you’re trying to get home after a long day working. Unlike with NJ Transit’s impressive MyBus Now service, it is not possible to get live updates on where a Coach USA bus is, leaving you with no option but to sit and wonder when it is going to show up. NJ Transit could potentially offer many of these features, as they do on their other bus services. It would be quite a long line, but would connect a lot of communities that have grown substantially in recent decades, and increase car-free access opportunities to many local workplaces. This entry was posted in Alternative Transportation, Local, Princeton, Transit and tagged Bus, New Brunswick, Princeton, Transit. Bookmark the permalink. How does NJ Transit Rail do for this journey? I suppose it’s too much of a detour from where you’re starting?